The Huracan looks like a bad buy when you compare it to the R8. Audi has just announced pricing for the 2017 R8 Spyder, and once again it seems like the Germans are intent on screwing over their Italian counterparts. 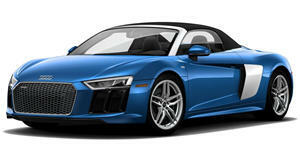 The R8 (rain drop) droptop costs $176,350 and will do 0-60 mph in 3.5 seconds and tops out at 198 mph. It is powered by a naturally aspirated 5.2-liter V10 engine making 540 horsepower and 398 lb-ft of torque. Power is routed through all four wheels via a seven-speed dual-clutch transmission. The cheapest Huracan convertible you can buy is the RWD model, priced at $200,000. Like we said, Audi has once again screwed over Lamborghini. The RWD Huracan makes the same torque as the R8 but its horsepower output is higher, 572 hp to the Audi’s aforementioned 540 horses. Aside from the slightly cooler look the performance specs are nearly identical. The RWD Huracan Spyder will hit 0-62 mph in 3.6 seconds and tops out at 198 mph. The AWD Huracan Spyder is more powerful, with its 5.2-liter V10 spitting out 602 hp and 413 lb-ft of torque. It races from 0-60 mph in 2.8 seconds and can break 200 mph. However, all that comes at a cost of almost $100,000 more than the Audi R8 Spyder. If the Germans ever decide to offer an R8 V10 Plus Spyder the performance, and pricing gap, would close considerably. If it were our money the R8 Spyder would get serious consideration. Then again, if someone is willing to spend $176k on a convertible supercar it’s hard to believe an extra $25,000 for more power and better looks would be a deal-breaker.